My mum use to make raw banana or plantain bhajias or fritters for Ekadashi. No measurements, she would just mix grated banana with mashed potatoes and spices. Simple and yummy. However, I was yearning for some kofta curry. 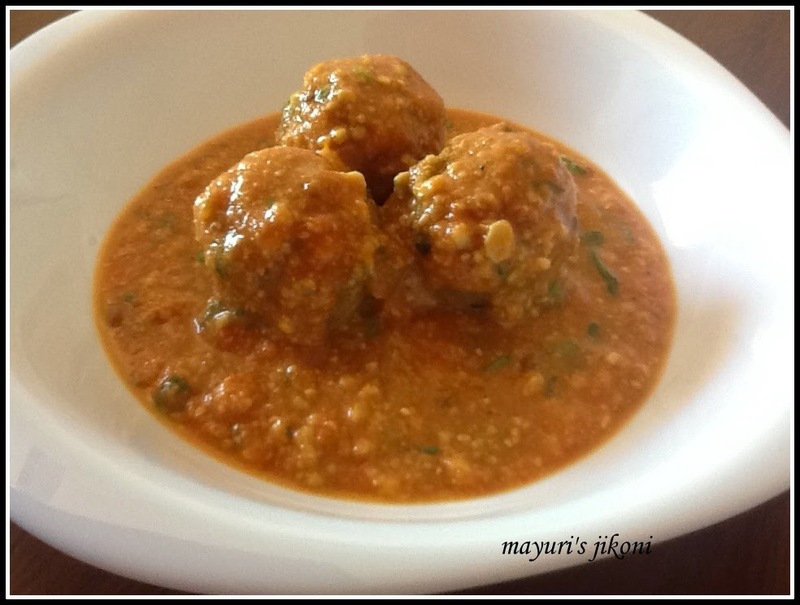 Ekadashi and kofta curry. Well that is possible. I made them with plantains and paneer. Kofta curry without onions and garlic you might question? Well its totally possible. I didn’t want to make rajgira puris as I find them too oily. Instead, I made some farari theplas and the meal was ready. Normal sweet bananas are eaten as a fruit and the green plantains, sweet plantains or raw bananas are different. They belong to the banana family but are used as a vegetable. The fleshy part of the plantain is low in sugar, starchy and gluten free. Ripe plantains may turn black but the fleshy part retains its shape when cooked. Plantains have a thicker skin compared to normal sweet bananas. You can use cooked plantains instead of potatoes. Some prefer to remove the skin and cook the flesh and some cook it with the skin and then peel it off. I prefer to boil it with the skin as its easier to peel it off once cooked. Wash the plantains thoroughly. Trim both ends. Cut into half. Put the cut pieces into a saucepan. Cover it with water. Add ¼ tsp turmeric powder. Cover the pan and place it over medium heat. Cook till the plantains are done. Remove them from the water and let it cool slightly. Add the rest of the ingredients for the kofta. Take about a tablespoonful of the mixture and roll it into a ball. You will get approximately 24 balls. Heat the oil in a wok or karai. When it is hot, fry 6-8 koftas turning them frequently. Fry them till they are light golden brown. Roast the cashew nuts over very low heat for 3-4 minutes. When the nuts are cool, process it in a processor to a coarse powder. Heat 2 tbsp of oil in a wide pan over medium heat. Add coconut paste and stir fry for a few seconds. Add green chilli and ginger paste. Mix and add the cashew nut powder.Stir fry for a few seconds. Add garam masala, turmeric and red chilli powder. Mix and let it cook over low heat till the gravy becomes thick. Add fresh cream and koftas to the gravy. Mix gently. Add coconut milk instead of fresh cream. If the gravy becomes too thick add a little bit of water. Can add peanuts instead of cashew nuts. wow no onion in gravy? still looks very delicious. Koftas look so delicious, looks like a perfect Jain recipe..